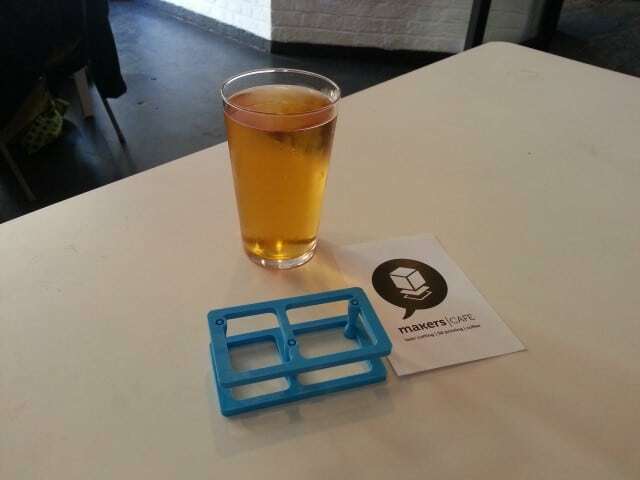 What do you get when you combine 3D printing, laser cutting, comfy seating, good coffee and cold beer? Well, you get a very curious Average Man for a start. Let’s rewind back a week. A colleague of mine shows me an article in TimeOut magazine about a new place called MakersCAFE opening just 15 minutes from our office. 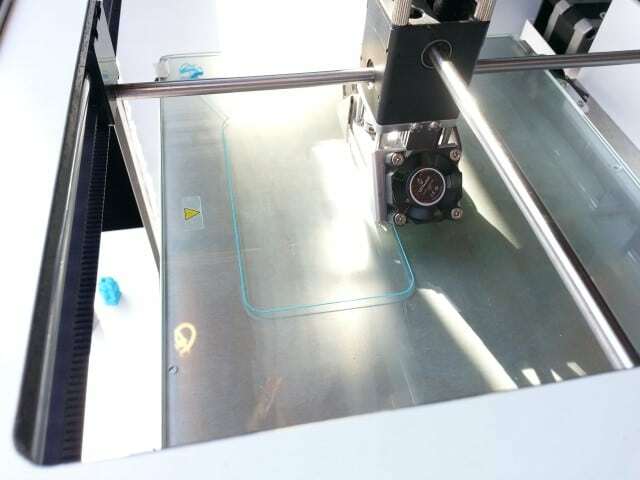 He tells me “you can get stuff 3D printed there” – knowing full well that this would excite me and ruin my concentration for the rest of the day. 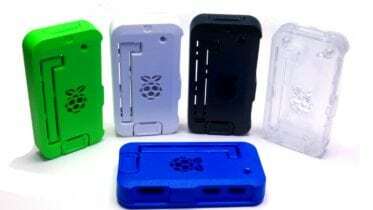 You see there’s a strong link between the Raspberry Pi and ‘making’, especially with 3D printing as there are so many designs for cases out there. A quick search online confirms the article – MakersCAFE was a reality and offered everything I had been looking for in recent months. 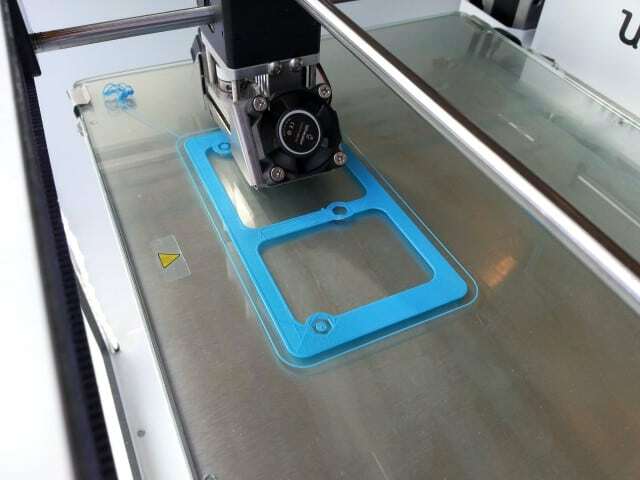 A way to get 3D printing done without spending thousands on machines, software and lessons! No less than ten minutes later I had emailed the chaps MakersCAFE asking for a bit of a tour/interview to share on my blog. 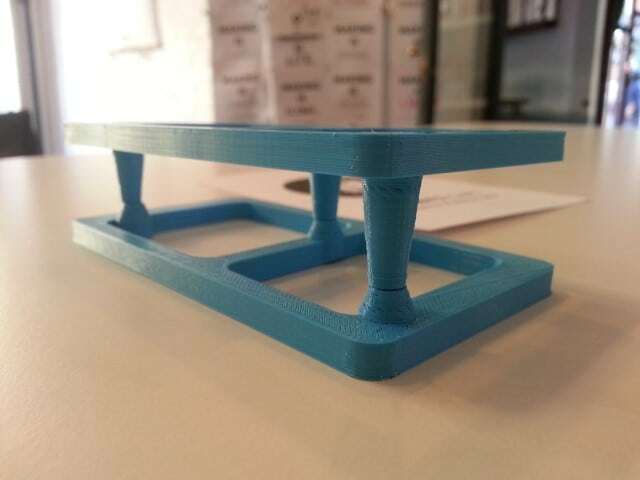 Founder Soner Ozenc invited me to join them for the afternoon, and even agreed to help me create my first 3D printed item – a Raspberry Pi case! It was a Friday afternoon that I had scheduled to meet the guys at MakersCAFE. With my office just down the road, I decided to use my (slightly extended) lunch hour to learn all about the coolest new coffee shop in town. The walk from Liverpool Street to Shoreditch is an interesting one – almost like crossing a border. In the space of a few minutes you transition from the concrete coldness of the city, to the warm, trendy and laid back cooltopia that is Shoreditch. On a busy crossing half way up Shoreditch High Street, I finally arrived at MakersCAFE. Being a bit unsure what to expect, I had a quick glance through the window before entering. A fancy bit of kit got most of my attention, which I assumed was one of the 3D printers (I would later print my own Raspberry Pi case on this). Behind this was what I would stereotype as a crowd of ‘design people’, purely because they were wearing much more fashionable clothes than me and looked like they knew what they were doing…some would call this jealousy. I poked my nose into the door to an instant warm welcome by Cris, the 3D printing expert at MakersCAFE. He quickly invited me to the rear of the store where he had already been reviewing the 3D design I had emailed over earlier than morning. My design was already on Cris’ laptop when I arrived. Spot on. Cris and the gang wanted to get my project created as soon as possible for me, all part of the MakersCAFE ethos (I’ll cover more on this later). They explained the job and my options to me in a familiar ‘Average Man’ fashion – assuming no prior knowledge and at a level that anyone could understand, which I found really refreshing. I handed over some crisp paper money and then proceeded to sit down with MakersCAFE’s founder, Soner Ozenc, whilst Cris and the team prepared my item for print. 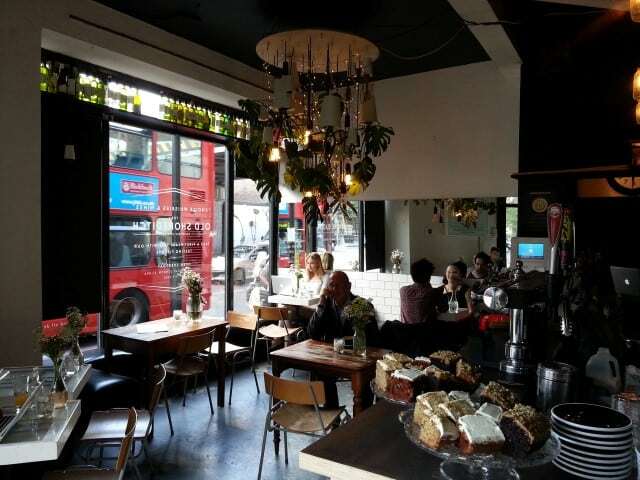 With the big media players such as BBC News, TimeOut magazine and the Evening Standard all recently reporting on the cafe, I was grateful that the founder made some time for a feature on my ‘Average’ blog, especially considering they’ve only been open a couple of weeks. 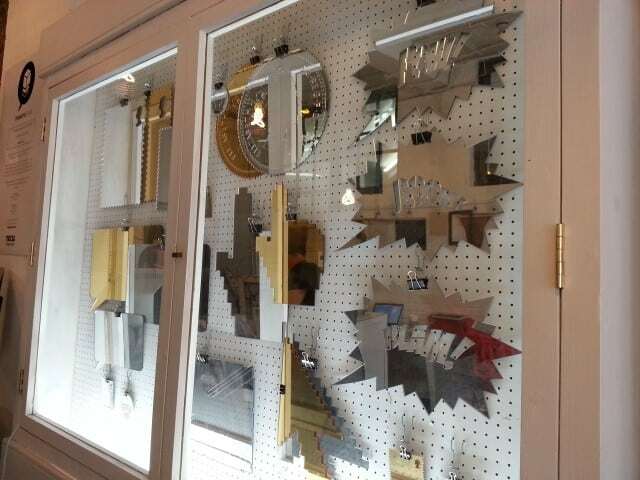 Soner introduced himself and led me to the middle section of the shop which is kind of a mix between a coffee shop and somewhere to work on thoughts, designs and makes. 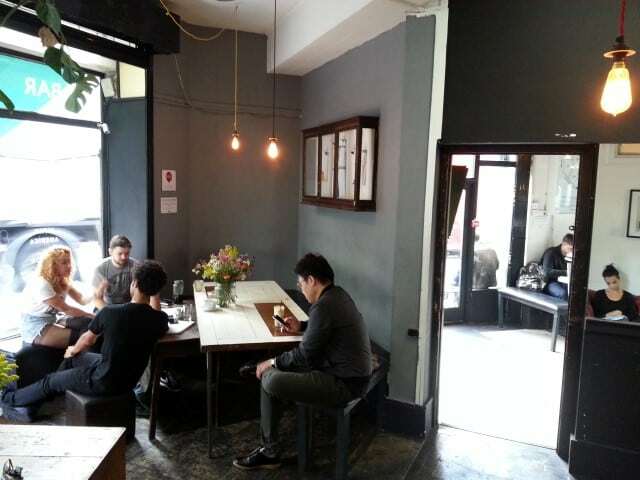 It has a laid back calm atmosphere with that warm whiff of coffee beans which felt like the perfect place to meet with fellow makers. I came armed with a list of questions eager to find out more about Soner, MakersCAFE and 3D printing in general. 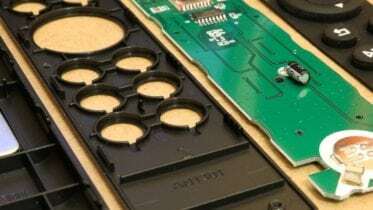 With the experience from this, in 2006 he set up laser-cutting firm RazorLab, the UK hub for Ponoko which prides itself on being “The World’s Easiest Making System”. This regional ‘hub’ setup cuts fees, postage costs and most importantly – time. This ethos is clearly a big part of MakersCAFE as well. The next project was MakersCAFE. 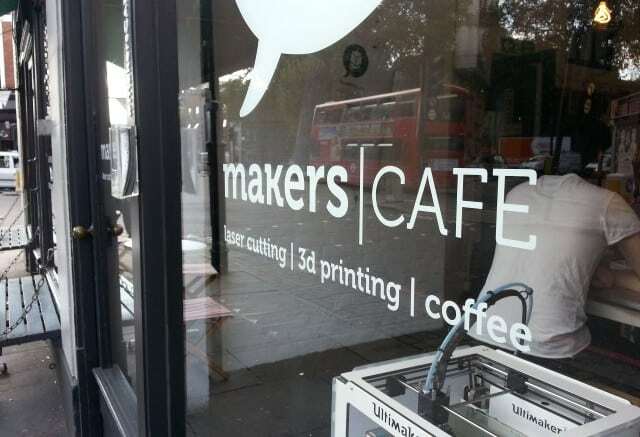 Around 2 years ago Soner purchased MakersCAFE.com with the intention of eventually creating a place for makers to gather, discuss, learn, share and make (and clearly he did!). Soners impressive record as a mechanical engineer, product designer, web developer and now Barista make him the perfect kind of person to start something like this. One thing that was clear from our discussion is that Soner isn’t the kind of guy to sit still. 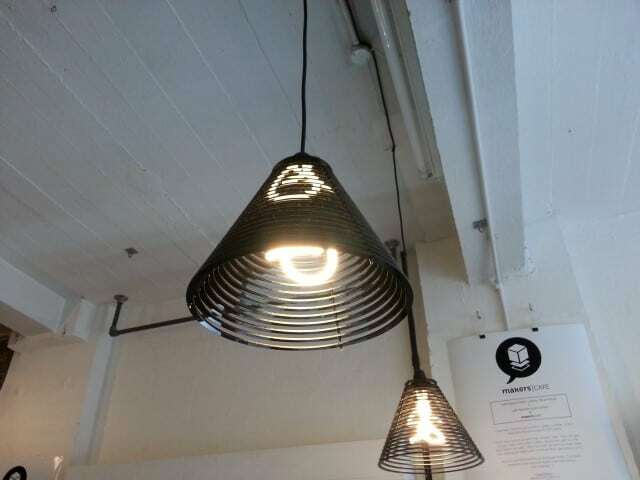 With the Shoreditch location being the proof of concept for MakersCAFE, we discussed what was next for the brand. Soner explained that he plans to create new branches in New York and Sydney. Following this, franchising out to the rest of the world would be the next step. No stopping this guy! Naturally I was keen to bring up the Raspberry Pi and we soon got talking about the link between MakersCAFE and the popular micro-computer. Soner explained how the MakersCAFE is for ‘anything to do with making” and not just getting 3D printing/laser cutting work done. He talked about how some people simply just come, grab a coffee and ‘3D print watch’ – I guess it’s a bit like bird watching for the modern age. 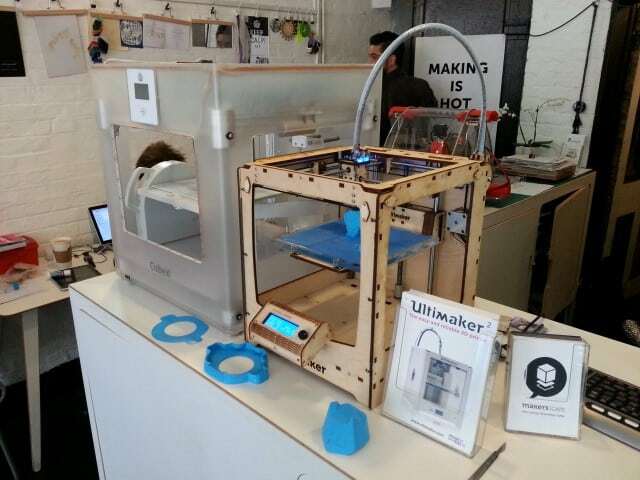 The MakersCAFE welcomes all forms of maker to meet, collaborate, share ideas, prototype and get a good brew at the same time – with no obligation to do any printing/cutting. Our discussion about different maker types soon moved to one of the other sides of MakersCAFE – events. 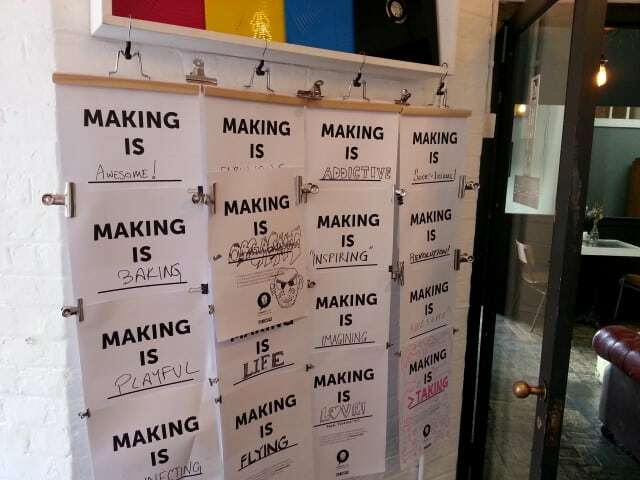 So what exactly can you get made at MakersCAFE? The one we already know about is 3D printing. 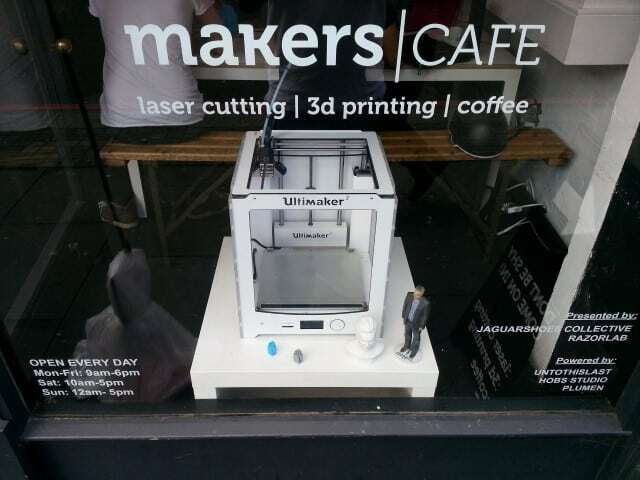 The cafe has a number of 3D printers dotted around the building, an even one in the main window. Just behind a couple of these 3D printers was a food-based printing machine. 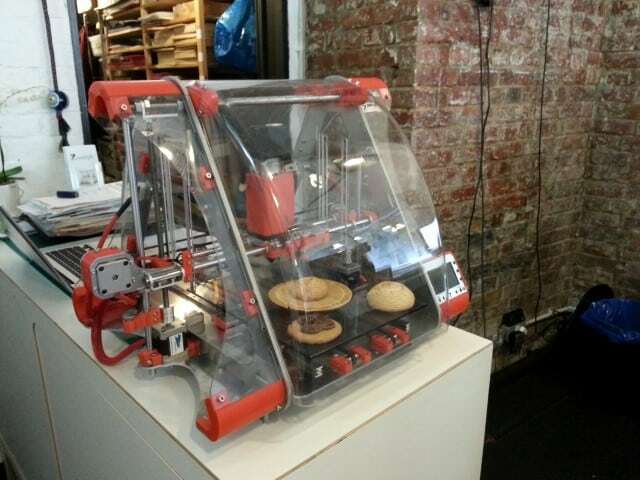 A 3D print style machine that can make real, edible food. Yes really! During my chat with Soner he mentioned that he wanted to change the perception of manufacturing from the cold/dirty/smelly factory scene, to somewhere warm and inviting where you can order a pop-up dinner to be 3D printed right in front of you. 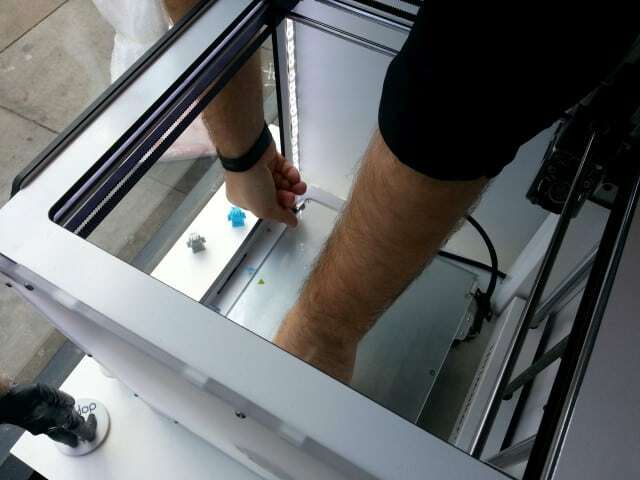 A 3D food printer. I’ve seen it all now…cutting edge stuff! Within the main counter itself is a laser cutter. Soner explained that jobs of pretty much any size can be catered for, however larger stuff goes to a top secret location to be completed. The whole time I was there, I couldn’t help but feel somewhat inadequate. Being 100% average, I have no software or skills to design anything that could be made on these fascinating machines. 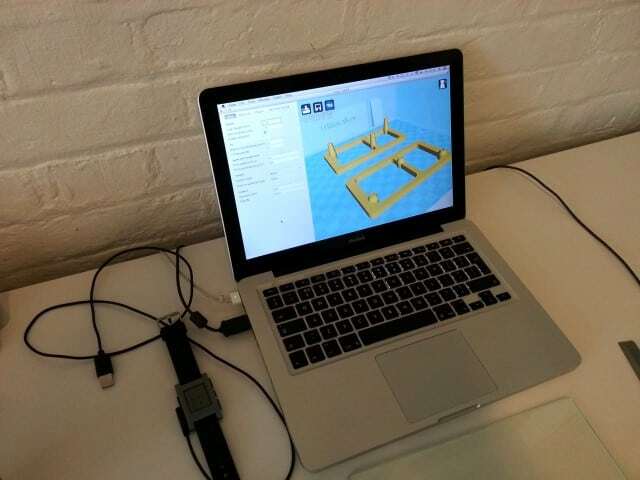 But this is the great thing about MakersCAFE and the 3D printing scene – you don’t need to have the software or skills. With Soner’s team of experts, the cafe offers an optional consultancy service to help you with your design. People like Cris (the 3D printing top boy) for example, could help you tweak your design, offer advice and provide technical knowledge and experience that will more than likely save you money in the long run. They even mentioned that they want to get to a point where you could come in with an object and simply ask for one of the team to design it in the 3D software for you. Obviously this comes at a price, and at MakersCAFE it’s a simple and clear £1 per minute. Another way of getting around this pure lack of talent is Thingiverse. You what? Yes ‘Thingiverse’ – it’s a website where ‘makers’ log in and share their designs with the rest of the world, and i’m pretty sure 99% of them are free to download and use, and even modify if you have the necessary software. Find all sorts of good stuff at Thingiverse! At first you might wonder why you would want someone else’s design that they made for their own tastes and needs, however there are simply thousands of designs on there to be picked up and printed. In relevance to this blog, a quick search for “Raspberry Pi” brings up a huge list of innovative case designs. 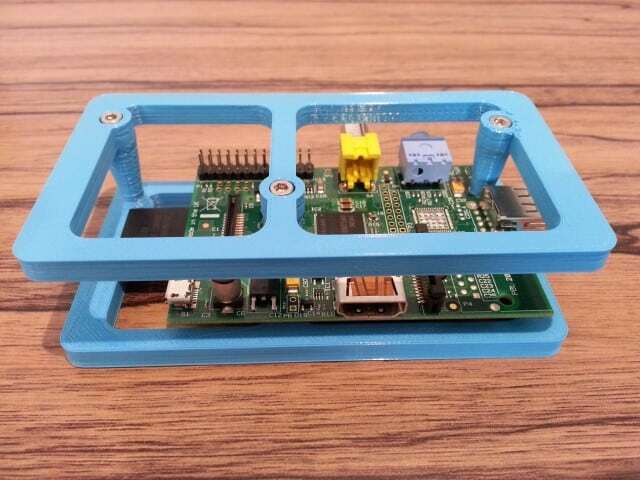 For this article I was desperate to see something being printed and also really wanted to have a souvenier to take away, so I downloaded this Raspberry Pi Exoskeleton case design from Thingiverse made by a chap called Jose Torre. 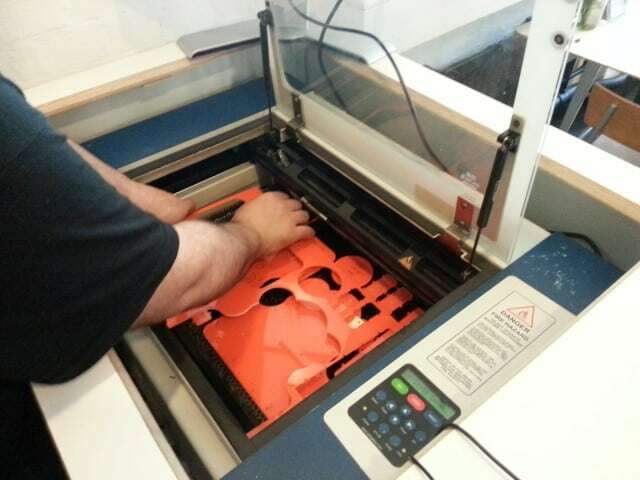 Cris and the team were already setting up my case to be made whilst I was having a chat with Soner, so the next part of my tour was to watch my case being made. Cris is the in house 3D expert at MakersCAFE, so he walked me through the process of how we would turn my design file into a 3D printed object. I got the impression that Cris is one of the very small percentage of people who genuinely loves going to work – he has a permanent smile when talking about anything to do with 3D printing. I was filled with jealousy the whole time I was there, mindful that I had to soon return to my soulless city office. My case was being made at the ‘Rapid’ 210 micron quality setting, which is the fastest and cheapest option that MakersCAFE offer. Cris explained the different options, and why you might want to pay more for a lower micron level for a smoother end product. It all depends on what you’re making, your budget, and kind of the object’s application in the real world. It wasn’t too long before the machine had made progress on my case, and I could see the end result generating right before my eyes. Despite opting for the rapid setting, it would still be a few hours before the case would be finished. There is no obligation to be present when getting something printed, so I took a few more pictures and then headed back to work. 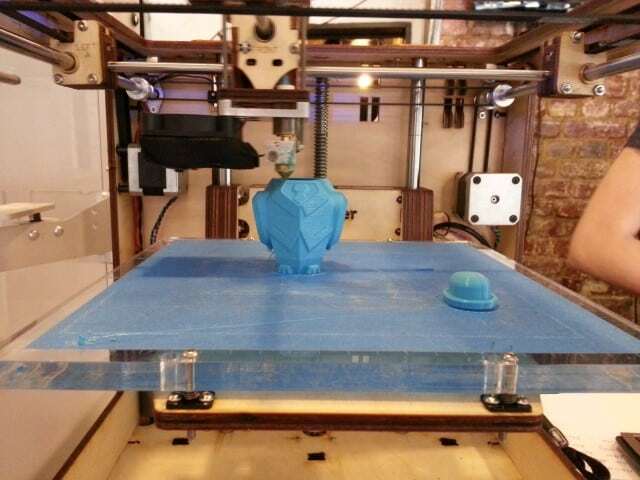 I can see why some people just watch 3D printers – fascinating! Work finished at around 5pm. The cafe is open until 6, so I took a casual stroll back through Shoreditch to collect my finished item. I arrived to find Cris still seemingly loving every second of his employment, helping a few guys with their key holding design prototype. Maybe his easy access to good strong coffee helps with his enthusiasm? Cris handed me my finished case and invited me to take a seat to look at it, work on my blog or whatever else I might want to do. I really love the casual nature of this place! I stayed for a beer, and kicked back watching the various groups of people working away at their designs and prototypes. I decided it was a good time to have another look at Thingiverse on my phone for the next ‘thing’ I would get made here. A few of the MakersCAFE team came over for a chat, answering a few last questions that I had before I finally packed up and left for home. I had a great afternoon at MakersCAFE and I really can’t wait to get back there for another fun-filled printing session. If you think 3D printing is one of those inaccessible expensive things that the average man can’t get involved in – think again. With sites like Thingiverse offering thousands of free designs, and MakersCAFE entertaining any kind of project big or small – there’s really no reason to fear this great new technology. Even just rocking up for a coffee and to watch other people ‘making’ is a great way to learn more. MakersCAFE offers an inviting and inspiring space for makers of all types to come together, collaborate, share knowledge, make and get a decent drink at the same time. I’m pretty sure MakersCAFE caters for pretty much any and every hobby out there – so get yourself down there and go make! 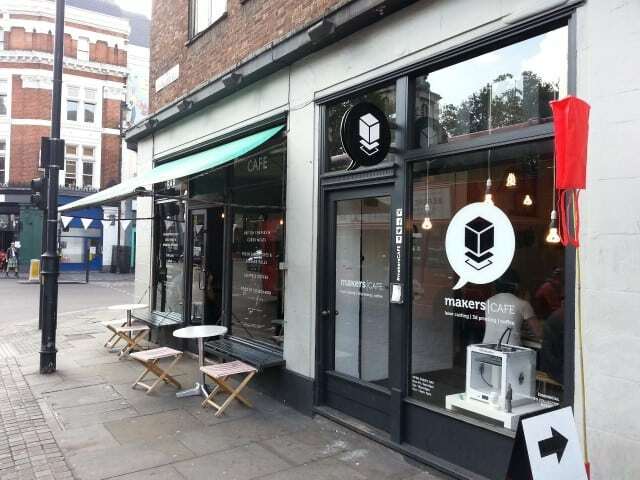 Be the first to comment on "MakersCAFE – A New 3D Printing Cafe in London"